New USAC/CRA Race Director conducting business at the March 30 pit meeting at The PAS. Doug Allen Photo. The renewed enthusiasm and old school feel mentioned above are being generated by a pair of sources. One was the naming of Tony Jones as Racing Director of the USAC/CRA Series and the other is the USAC Southwest Sprint Car Series switching from 360 to 410 cubic inch engines. Both developments took place over the winter and have met with favorable reviews from PAS fans. Jones, who won the Oval Nationals in 2000 and the USAC/CRA championship in 2007, is arguably the most popular driver to ever compete at The PAS. A tremendous racer on the track, the 48-year-old Orange, California resident was extremely fan friendly. And, he was never afraid to voice his opinion on racing and the way it should be run. That makes him a perfect fit for his new job. One of the ways Jones is trying to get drivers excited is by getting more sponsors involved in the series either with added money or contingencies. For example, some of the sponsor money goes to a drawing that awards one team a rear tire (over $200.00 in value) at every pit meeting. While Jones wants to help the racers, he is also showing them and wants them to know, there is a rule book and he plans on sticking to it. Like Gary Sokola, who ran the original CRA in one of its golden eras from 1977 through 1987, Jones wants competitors to know they are all racing from the same rule book and the rules will be followed. 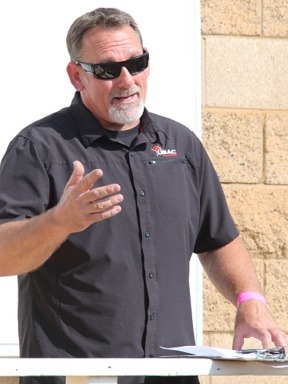 At the first race of the season last month in Arizona, he served notice when he penalized over ¾ of the field for presenting their cars late for the main event. In the subsequent two races, not one team has been late. The other part of the equation is the previously mentioned USAC Southwest Series moving from 360 to 410 engines. When Manzanita Speedway in Phoenix closed its doors in April of 2009, it essentially brought a halt to regularly scheduled 410 sprint car racing in the Copper State. Since then, sprint car racing in Arizona switched predominately to 360 racing with first ASCS and then USAC. When it was announced over the winter that the Southwest Series was switching back to 410 racing, it brought hope for increased fields for both the Southwest series and USAC/CRA. The first race of the season at The PAS bore that out with a fine 27-car field that included six Arizona cars in the pits. In addition to the USAC/CRA Sprint Cars, The PAS Senior and Young Gun Sprint Cars will also be in action. Tickets for Saturday’s race are $25.00 for adults. Seniors 65 and over get in for $20.00. For active military with proper id and their spouse or date, it is $5.00 each. Teens 13-18 with their school id and kids 6-12 get in for $5.00. Children 5 and under are free. Parking on the fairgrounds is $8.00. Camping on the fairgrounds opens at noon on Friday. Tailgating on the grassy area outside of turn four begins at 1:00 P.M. on Saturday.